“You can only learn so much by listening and analyzing and reading,” said Harvard Professor of Music Richard Wolf. “To be able to actually play an instrument helps you listen better, and understand the music better.” In recent years, Wolf has made that hands-on component more central to his classes, which often culminate with a free performance like tomorrow's concert at Paine Hall at 7 p.m. When he arrived at Harvard in 1999, Richard Wolf brought with him a deep knowledge of South Indian classical music and a desire to share it. In addition to asking his students for a rigorous analytical and ethnographic study of non-Western songs and musical styles, he wanted something else from them. To understand the nuances of the dynamic sounds created by Indian instruments, they had to learn how to play them, such as the elegant vina, a southern lute carved of wood, with strings that players bend with their fingers to reach notes and tones not found on a typical Western scale. 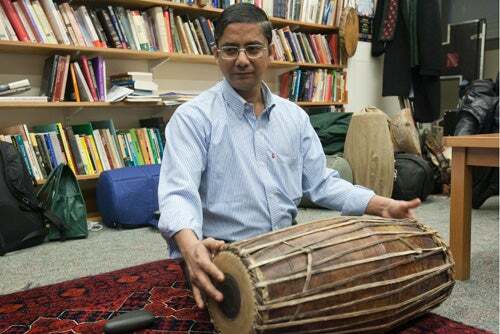 So Wolf, with support from Harvard’s Department of Music and its Office of Undergraduate Education, acquired several vinas and South Indian mridangam drums, along with instruments from Iran and Africa, for his courses, which examine the musical traditions of South and West Asia, with a focus on India, Pakistan, Iran, and parts of Africa. Umayalpuram Mali, a visiting scholar and mridangam master from South India, will perform in the April 21 concert at Harvard's Paine Hall at 7 p.m.
“Since that time, my courses have had a hands-on component,” said Wolf of his efforts to make performance a regular part of his pedagogy. The practice has gained traction at Harvard, buttressed by the findings of President Drew Faust’s Arts Task Force, which called for a greater support of the arts and the inclusion of performance and art-making in the Harvard curriculum. His classes now often culminate with a public performance, such as tomorrow’s concert featuring Wolf and Umayalpuram Mali, a visiting scholar and mridangam master, as well as several of Wolf’s students. The free performance will take place at the recently refurbished John Knowles Paine Concert Hall at 7 p.m.
To help his students learn the complexities of the instruments, Wolf secures some of the best teachers in the world. Since his arrival at Harvard, he has enlisted a steady stream of visiting professional artists from near and far who work with students. “The students are really receptive and so willing to experiment,” said Mali, who is from South India, practicing with Wolf on the floor of his office in the basement of Memorial Hall. In residence for the spring semester, Mali has worked with students both in and out of class, helping them to understand the intricate music, which is learned by rote instead of written notation. Keeping the rhythm for the informal jam session — which, like much of the music, was grounded in improvisation — was Sarah Sussman, a graduate student in ethnomusicology who took Wolf’s class and now acts as a teaching assistant for the course. In addition to being a professor in music at Harvard, Wolf is widely recognized for his talent in performing with the vina. As a student at Oberlin College, he studied music and math. After attending a vina concert in school, he applied his knowledge and experience with the guitar to understanding the plucked instrument, and was hooked on it. Henry LaBarre Jayne Professor of Government and Professor of African and African American Studies Jennifer L. Hochschild collaborates with Vesla M. Weaver and Traci R. Burch on "Creating a New Racial Order: How Immigration, Multiracialism, Genomics, and the Young Can Remake Race in America."